On a personal note, I recently became a dad again for the second time! So I’m quite tired and may not be very good at writing something intelligent, and todays entry will be short. The game I’m talking about today is called trap, and was written by Bruce Brandt in 1993 from what little information I could find on the internet. It was written in gwbasic and is now freeware. The game has no story, and is pretty basic. You move around a grid of rotating doors and your task is to trap the monsters that are travelling around in as little time as possible. Monsters will randomly teleport if you run into them directly or if you push a door into them. It’s surprising fun in short bursts in the same way that minesweeper is. Once you figured out the best ways to trap the monsters you can get you time down quite quickly. I was able to finish the game in about a minute at best but usually take about 90-120 seconds. You’ll find that it gets more difficult based on where the monsters start. If you find a monster at the edge of the map, it’s often a lot easier to force the monster to teleport than to try to trap him where he is. Some times the starting position of the doors can be a hinderance, but you can usually get around this. Running the game is pretty easy if you’re used to running programs in gwbasic, but there is also a pre-compiled DOS version around as well. It’s quite a difficult game to locate on the internet these days, but if you search for the author’s name and the word trap you should be able to locate it within an old BBS archive still around on the internet. I originally got it from a shareware disc from a magazine that my older brother bought so searching along those lines may also help. The instructions for the game. 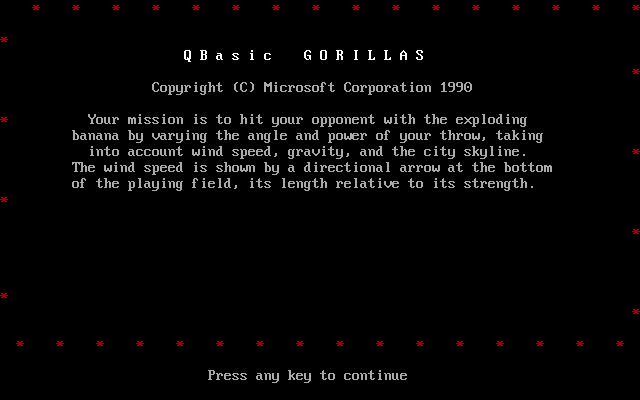 Gwbasic holds a lot of fond memories for me. I was about ten when dad gave me a book about programming in basic, and our computer, a 386SX with dos 4 on it, had gwbasic on it. The book I got was actually not even for the right platform. It was called 30 hour basic and was written for the BBC micro, I was fortunate in that it didn’t use any of the advanced features of the beeb, and that gwbasic supported everything in the book. I breezed through the book, typing the programs in, then trying my own variations on how they worked. Most of the programs were simple and there were basically no games in it. My imagination however was sparked, I instantly wanted to be a programmer and to write computer games, but learning to do this in gwbasic and with very little in the way of assistance from books or anything else was a bit of a journey. For starters, there were no block if statements, or easy to use editors. Gwbasic used the same system of writing programs that the old microcomputers of the 80’s used. 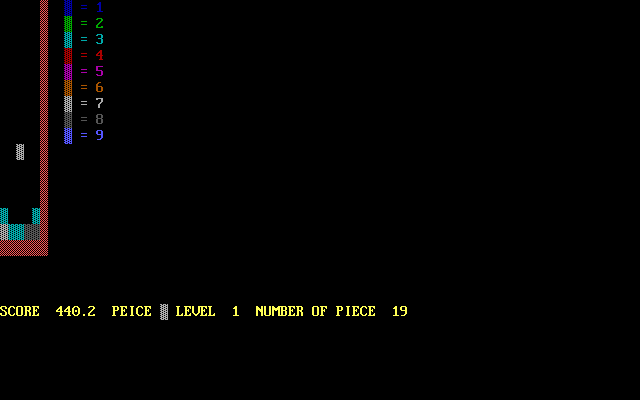 This meant typing in a line number and the code that you wanted, without being able to easily reference previous code. User definable functions and procedures were limited to what you could type on a single line, so I very rarely used them. I often used gosub and goto to accomplish the tasks I needed. This often led to a well know problem with basic programs. Spaghetti code! None of these things deterred me from writing and experimenting. I had found that there were shortcut keys using the alt key in combination with a letter to produce a keyword. I basically tried a combination of different things until I had worked out the syntax of the command. 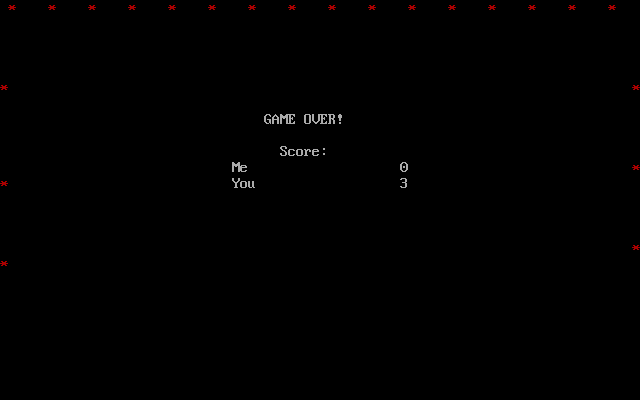 I very quickly learned enough to produce simple ascii games, that were usually often attempted clones of other games. One of the first I made was called numdrop. It was meant to be a sort of clone of tetris, but being a kid I wasn’t yet good enough to make something as complex as tetris. So I came up with the idea that there would be single blocks falling like in tetris, but instead of having different shapes, I would have different weighted blocks. Larger blocks would crush smaller ones and earn you points. My older brother helped me, by finding a timer function that allowed accurate timing for the speed of the game. As the levels progressed you had more blocks before the end of the level, and the game speed would increase. Up until this point the most I could do with the graphics was draw lines and circles using the basic drawing commands available. Then my dad bought us the gwbasic reference manual, now I had the power! Reading the manual lead to the ability to use bitmap graphics, which as you probably know are important for games. I rigged up a simple sprite creator that basically had you entering the colour of each pixel by number, and created my first proper graphical game, Jump. It was a simple single screen platform game where you had to avoid a green monster, and a missile that would come out from it. The gameplay wasn’t great, but as a proof of concept that it could be done it worked a treat. This really was the starting point for me, now I could write proper games. I even started to write a windows clone of sorts, called farout. This was quite an ambitious project, and I did manage to make the basics of it. It worked by having a set of routines and variables that were basically a template for each program I wanted to make. The programs would use the chain command to switch from program to program, so no multitasking was possible. A program could save it’s state before chaining back to the main program, allowing some simple windows like functionality in that you could suspend a program for use later. I even created a boot disk that automatically started it. The loading and switching of programs proved to be a little slow on floppy disk, the medium I was using the most at the time. So I whilst the base system was completed, I never really wrote many applications for it. Gwbasic had limitations to the size of the data and code combined. It was about 60300 bytes if I remember correctly. This was only because of how the interpreter was written, the memory model it used could not take advantage of more than 64Kbytes of ram. programs were stored in memory in the form of tokens in a binary format that saved a lot of memory. 64K may not sound like much but you could do a heck of a lot with it! When it came to graphics however, and storing a lot of sprites for a more complex game, the memory was not really enough. I was beginning to want to build larger and more complex games, and upon starting them found I didn’t have enough room. 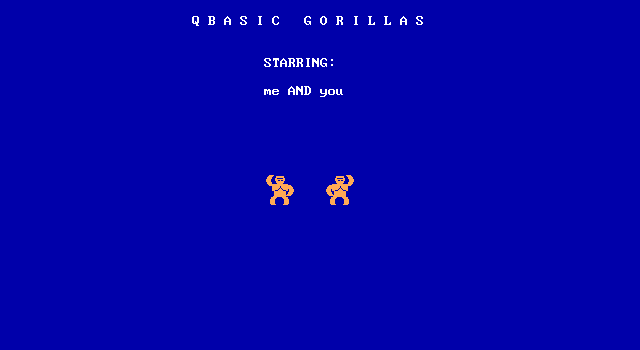 This is where I stopped developing for gwbasic as a kid, and moved onto qbasic which had come out with the newer versions of DOS, and was on the computers at school. I still have all the old programs that I wrote as a kid, and I occasionally go back to them from time to time. Recently finding one of my old games had suffered data loss (fortunately nothing else was lost) I began to re-write it as an ascii art game. After having moved to more professional and higher level languages, programming for gwbasic was a bit of a strain on the memory. I never did this as a kid, but I’ve found keeping a running documentation of the program as you develop it helps immensely. Especially as you can’t label subroutines with sensible names. The challenge and power of the language to keep my interest has not faded, and as I write this I’m entertaining ideas of what I could squeeze into it. Stay tuned, I may fix up and release some of my code here. If you have any experiences with gwbasic, please comment bellow, I’d love to hear how others experienced the language.